CORAL GABLES, FL – The Tiger women’s tennis team completed the second day of action at the Miami Invitational in Coral Gables, FL. Doubles action concluded on Saturday, while singles competition will continue on Sunday. Carol Salge fell in the semifinals at flight one, suffering a three-set loss to Lauren Macfarlane of Florida State (6-3, 3-6, 7-5). 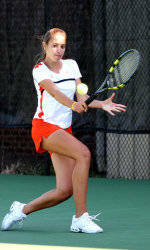 In the flight one consolation bracket, Ani Mijacika prevailed over the Seminoles’ Nicole Slater, 2-6, 7-5, 10-8. She will face Jacqueline Lee of Iowa in the consolation finals on Sunday. In the flight two-consolation division, Ina Hadziselimovic fell to Iowa’s Milica Veselinovic, 6-0, 6-2, while Maria Brito was defeated by Carolin Walter of Florida State in three sets (3-6, 6-4, 7-6). Selma Babic dropped a 6-3, 6-3 decision to Miami’s Caren Seenauth in the consolation bracket at flight three, while Samantha Eppelsheimer fell to Kelcia Klockenga of Iowa, 6-4, 6-3 in the flight four consolation rounds. Kathi Gerber and Alexandra Luc both suffered losses in the semifinals of the flight five division. Gerber dropped a three-set match to Maria Vallasciani of Florida International (0-6, 6-1, 6-4), while Luc also fell in three sets against Florida State’s Tapiwa Marobela (6-2, 4-6, 6-0). In the doubles A bracket, Clemson’s duo of Salge and Mijacika was defeated by Miami’s team of Banada and Farah in the finals, 8-3. Federica van Adrichem and Hadziselimovic fell to Walter and Mansour of Florida State by an 8-1 margin in the B division consolation, and Babic and Eppelsheimer also dropped an 8-1 decision to Miami’s Seenauth and Sabatino in the same division.